On any Saturday at 9:59 a.m., about 100 bargain hunters stand outside the popular Room & Board outlet in Golden Valley waiting for the doors to open at 10 a.m. This Saturday, Jan. 5, many frugalistas for home furnishings will move to Room & Board's main store in Edina on France Avenue when the semi-annual sale begins at 10 a.m.. It's a bees-to-honey event for Room & Board fans who usually make a beeline to the store on Dec. 26 for savings of 20 to 50 percent on floor models and discontinued styles. But this year the company is starting the sale later to allow more customers to take part and give staff more time to prepare for the sale after the holidays, according to Room & Board spokeswoman Jill Linville. How is this sale different from any other furniture store sale? Room & Board is the rare home store retailer that doesn't have sale cycles in which an item's discounts gyrate from zero to 50 percent from week to week. R&B customers know there are only two ways to get a lower price--wait for the semi-annual clearance sales to see if the item is discontinued or sold as a floor model or watch for it to show up at the Room & Board outlet store in Golden Valley, which is open Saturdays and Sundays. Here are some tips to shop the sale that starts Saturday and ends Tuesday in Edina. 1. 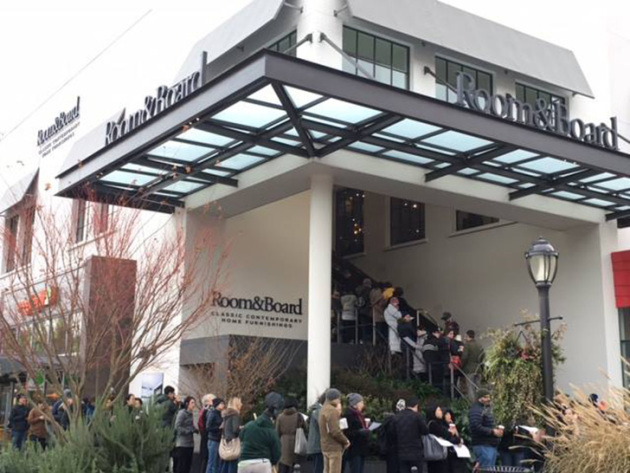 Shop Roomandboard.com starting at 12:01 a.m. Saturday to get first crack at the deals. All clearance items, but no floor models, will be priced and available for purchase then. To preview the discontinued items online, look for ones marked as "Discontinued 1/5," such as the Calvin Three Drawer Dresser. In the Edina store, look for the "discontinued" yellow label on the price tag. 2. Consider getting in line by 9 a.m. at the Edina store Saturday to improve your odds of getting a specific item. The store opens at 10 a.m., but the parking lot will likely be full by then. 3. Floor samples won't be identified and marked until after the store closes on Friday, Jan. 4. 4. Discontinued items can be returned, but floor samples are final sale. 5. If you're new to Room & Board sales, lay claim to an item by sitting on it or standing next to it with your hand on it. Make sure it doesn't already have a "sold" sticker on the price tag. Then wait for a salesperson to come to you to pay for it. Unsold floor models will be moved to the outlet after Jan. 8. Room & Board has its own tips for the sale here.